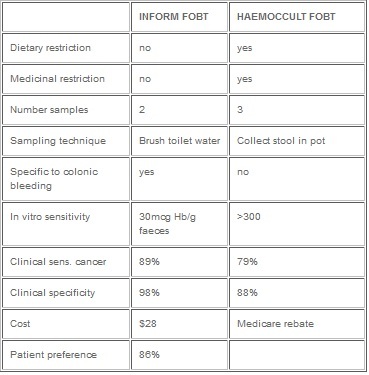 Screening for Bowel Cancer with Faecal Occult Blood test. Three large randomised placebo controlled trials have consistently demonstrated screening for bowel cancer with faecal occult blood test (FOBT) reduces mortality from bowel cancer by up to 30%, this protective effect was sustained with extended follow up of the trials. In Jorgensen’s trial 30,967 patients were screened 2nd yearly with Haemoccult 2 FOBT vs. 30,966 controls (age range in both groups 45-75 years). Colonoscopy was offered if any test was positive. Mortality from bowel cancer was reduced by 18 % in the screened group at 10 years follow-up and 30% at 13 years follow-up. (Gut 50; p 29-32). b) Which test to use? The FOBTs used in all 3 trials were Haemoccult, chemical tests based on Guaic acid and the pseudo-peroxidase activity of Haem. These tests are not easy to comply with, 2 faecal smears collected on 3 consecutive days after 3 days of dietary and medicinal restriction are needed. Despite these limitations affecting compliance the studies none the less demonstrated a benefit in screening. There are no large trials using the immuno-chemical FOBTs for screening but it is anticipated they would reduce mortality from bowel cancer even more due to enhanced sensitivity, specificity and compliance compared to chemical FOBTs. These tests use a monoclonal antibody to detect human haemoglobin. c) Which patients should be offered screening with FOBT? Screening with FOBT should be offered to healthy asymptomatic individuals with an average risk of bowel cancer 1-2 yearly from the age of 50 years. Do you have a family history of bowel cancer? Have you have colonic polyps or bowel cancer? If the answer to all 3 is no then their risk is average; based on NSW cancer registry lifetime risk for colorectal cancer is 1 in 18 for men and 1 in 28 for women.